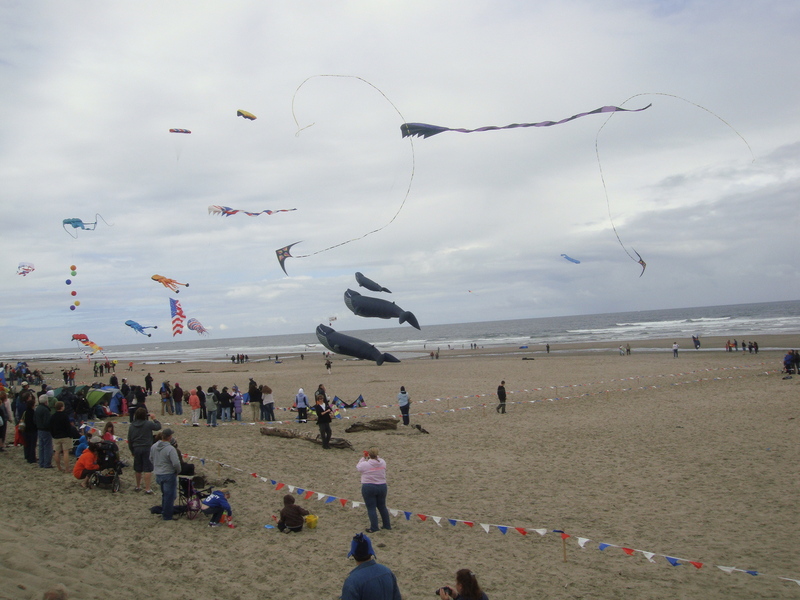 The 2012 Lincoln City Summer Kite Festival was held on the beach in the center of Lincoln City, at the D-River Wayside on June 23-24rd. After driving down from Portland, OR after work, we made the two hour drive to Lincoln City and stayed at the Coho Oceanfront Lodge on the north side of town. We woke up at 8am the next morning and headed out to the beach in front of the hotel to play around in the sand. Needless to say, the wind was so biting cold that I had to wrap towels around my head to fend off the misery. In the afternoon, the clouds broke and we had gorgeous, warm sunshine the rest of the weekend. The Kite Festival was fun. There was an MC who spoke and played music over a sound system. There were a number of shows where multiple flyers flew synchronized routines to music. We went across Highway 101 and visited the Snack Attack at 100 SE Hwy 101 for a bag of saltwater taffy. We chose an assortment of licorice, chocolate and other varieties. Overall, a good time for families and children.